Albert Einstein is supposed to have said, ’you do not really understand something unless you can explain it to your grandmother.’ It is even more vital today, with increasing complexity of scientific research and the growing public scepticism towards science, to be able to explain clearly and simply what our research means. Having enjoyed Brian Cox’s recent TV series Wonders of the solar system, I know that it is possible to captivate large audiences with the wonders of the universe with a combination of a clear message and an engaging personality. Explaining research, written by an experienced public information officer who has worked for MIT, Caltech, Cornell, Duke and the University of Wisconsin, declares the obvious need to start by understanding your audience and planning a communication strategy. He then proceeds to give very useful practical tips and information on how to explain scientific research through news releases, websites, interviews, podcasts, YouTube videos, popular articles, multimedia presentations and all the other methods of present-day mass communication. On talks, Meredith emphasises the need to use PowerPoint effectively, avoiding endless bullet points and complex tables and graphs. For good poster presentations, he gives tips on how to minimise words, maximise visual impact, and not to use the event as a jumping-off point for meaningful discussions. There is advice on writing scientific reports for print, on persuading administrators, legislators and potential funders on the value of your work, and on writing press releases for print and web; slogans like ’place your news peg high’ are explained. Explaining research gives good advice of dealing with the media, especially handling interviews on radio and television, making them work to your advantage. 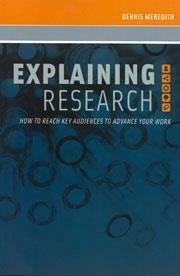 Overall this book is an excellent guidebook, full of practical tips and advice and, just as important, key things to avoid and illustrations of how not to do it, so that readers can, as the subheading says, ’reach key audiences to advance their research’.